We all came to the consensus that it would be enjoyable for Janie, Rob, and Alexa to give you all a taste of the night life in Bangkok and Ko Samet Island and its significance to the people. The dance clubs, and partying it entails, is truly part of our learning experience of the Thai culture and rewarding ourselves after our hard work in Ban Nam Hom and Kalasin. 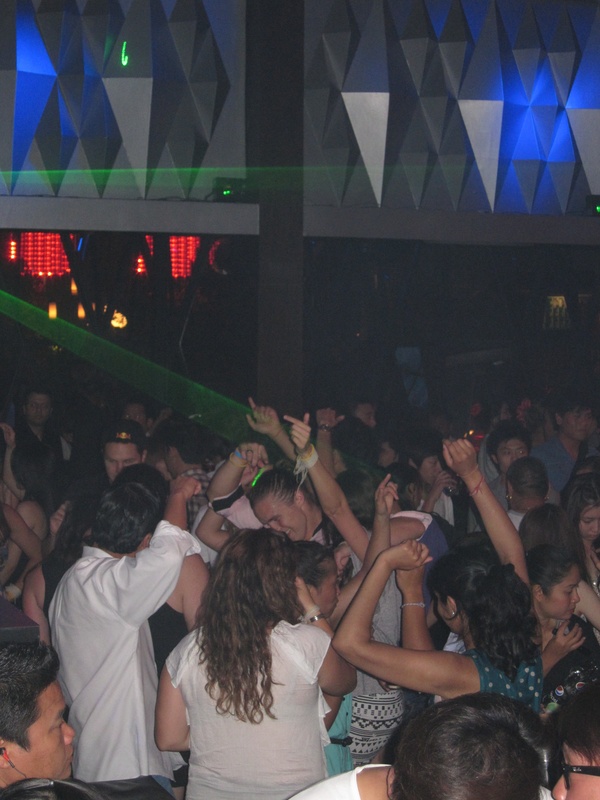 Rob is going to depict the night life in one of the biggest cities, Bangkok, since Alexa and Janie were literally considered party poopers that evening; while Alexa and Janie will describe a different type of night life and entertainment our group was able to experience on Ko Samet Island. When thinking about the night scene that Bangkok is so famous about, the first thing that came to my mind had to deal was the night clubs. From everything I had heard about Bangkok’s club were that they are something that from a different world. Night clubs are something for a large portion of the population that allows for them to get out and have good time. These clubs are a large part of their culture and have incorporated it into their everyday lives. Even on a Thursday night, which was the night myself and some of the other students went, the club was packed with a large amount of people inside and out. This scene was something completely different that other clubs that I have been to. Usually when people think of clubs the first thing that comes to mind is dancing, but this one was different in a sense that it was more geared toward talking and communicating with other people. In the main room where all the music was playing instead of a large dance floor there were tables. This was a bit different than what everyone had expected, but we all adjusted to a different environment and had a great time. It allowed for all of us that went to let loose for awhile after the hard work in the previous town. This night was the start of our relaxation for the trip and I personally feel we started it off on the right foot. Our first night on Paradise Island our May Term group was treated to a wonderful dinner on the shore line and a new form of entertainment, which may be considered foreign to us Americans, FIRE DANCING! This show preformed on the island was beautiful to watch as they waved their tortes and threw them to great heights. It was a fascinating way to see the lifestyles of some of the locals and the wide age range that started at just 17 years old. It is a very dangerous choice of career and takes great amounts of skill, practice, and repeated burns, yet they seemed to thoroughly enjoy themselves night after night. We traveled to different night clubs throughout the island and our favorite one in particular had the same local fire dancers who were very inclusive of us Americans in their show. They kept us entertained and allowed us to observe their culture on Ko Samet Island. Not only is fire dancing a big part of the night club, but the dancing is also a great hit. When traveling to these night clubs the music and dancing was always a hit. Everyone, especially the bar tenders knew us as the Americans. We would go out and dance on the dance floor every night; always the first ones to start the dancing. Everyone thoroughly enjoyed this great experience as we bonded with many of the other students. It was nice to see everyone relax and have some fun, it really opened up a lot of people and everyone was able to get to know each other and have a great time. One reason we go to this specific place is because it is the safest. Some of the people we know, know the bar tenders and every time they take a group of people there, they are always watching out for them. It was really nice to see how much the Thai’s enjoyed us and how much they are willing to do to protect us from the others.